There are solutions like simply creating a password protected page or using an existing plugin. But in some cases is just a bit too much. 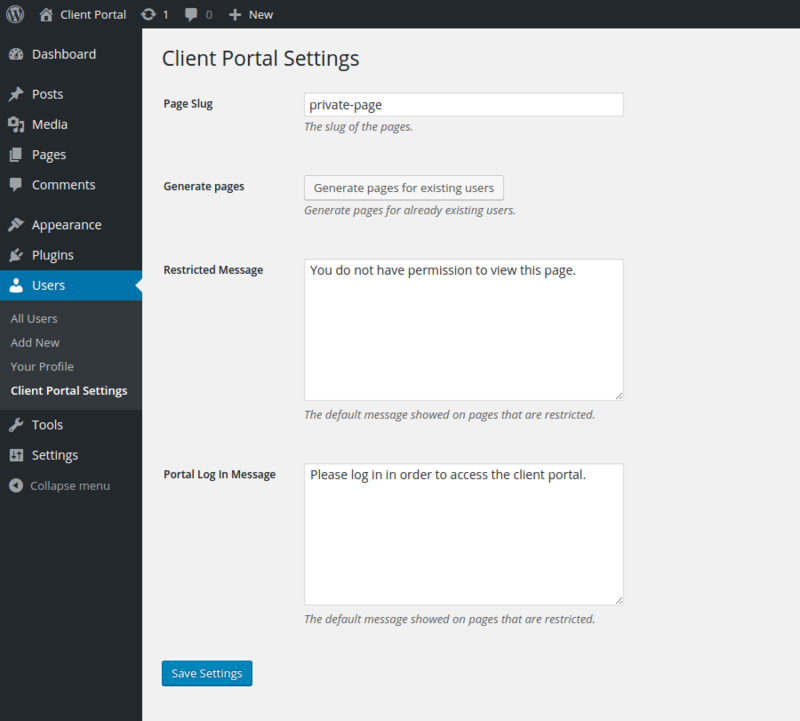 In this tutorial we’ll learn how to build a simple WordPress Client Portal plugin step by step. There are two main things we’ll go through: creating the client portal plugin and exploring what plugins we can integrate it with so we have a complete solution. * Description:  Build a company site with a client portal where clients login and see a restricted-access, personalized page of content with links and downloads. The main reason for using a PHP class instead of functional programming is to keep everything nice and tidy and limit the risk of naming conflicts. The __construct() function will contain all our hooks and filters as well as initiating the $slug, $defaults and $options variables that we’ll use throughout our client portal plugin. Any plugin that has options also needs some carefully chosen defaults that will work for the majority of users. We’re doing this inside the __construct() function. Using a custom post type instead of normal pages keeps everything clear and organized. The Custom Post Type gets added on the init hook. The private page slug is dynamic and can be changed by the administrator if needed. We’re also setting it up so it doesn’t show in the WordPress menu since we’ll be adding it under each user in the WordPress -> Users interface. Everytime a new user registers or is created by an administrator, we also need to create it’s private page. Same thing goes on post deletion. The correlation between a user and a private page is the CPT’s author. We’re also making use of cp_get_private_page_for_user() function that returns the ID for the private page for a particular user. We need to make sure that logged in users can only access their private page. The only exception is the administrator or users with the capability to delete_users. We’re blocking access by simply filtering the_content and returning something else instead if the user doesn’t have access or is not logged in. The error message displayed is taken from the plugin options that we’ll go through a bit down the line. Now that we’ve created the private pages for the client portal, we need to allow the administrator to access and edit them. Since the private pages are user related, we’ll simply list them in the User listing dashboard. The filter we’re using is user_row_actions. Once a client accesses his private page, it’s important to allow him to logout. So we’re adding a small logout link as well as his name in case the admin visits that page, so he know what private page he’s looking at. // author display name. Fallback to username if no display name is set. This is probably the most important functionality of the entire plugin. Once the user is logged in he needs to be able to access his client portal. By default there’s no way the user or the administrator to create a menu for each individual user. So instead we’re simply redirecting the user to his individual private page with the use of the [client-portal] shortcode. There are just 3 settings and a button for generating private pages for existing clients. If you want to learn more about the WordPress Settings API this tutorial covers it all. The function that generates a new private page for existing users is needed when you have clients already registered. 'author'            =>  $user->ID, // I could also use $user_ID, right? In order to take this a bit further, we’ll have a style the settings page a bit, add some admin notices, regenerate the permalinks if we’re changing the private page slug and make sure we don’t get next and previous posts navigation on our private pages. The last thing we’re doing is create a new object with our CL_Client_Portal class. Obviously there are other plugins that do the above so any login, membership or custom fields plugin will allow you to extend the Client Portal plugin to fit your needs exactly. Thanks so much for this tutorial and plugin. I use it on my website and I love it. I have one small question. Is there a way I can have pre-entered data on each private page when a new one is created for each user. I use my private pages as a transcript and there is a specific template that needs to be inserted into each page, how would I go about doing that? Please I want to add a welcome note and other related content/data to be displayed immediately a user private page is created. Please guide me on how to do this. I love you for what you are doing, God will reward abundantly. More power to your elbow. Good day! Nice addon, but the user can change the content of other pages. How can I restrict my rights so that the user can only edit their own page? The idea of this plugin is not to let the user edit this page, but only the admin to place private content, specific to that user on it. I too would like to be able to add a generic text that would automatically go on all newly created private pages. Is this possible? Yes, this is possible. After installing, go to Users -> Client Portal Settings and you will have a Content Box that lets you do this. I’m wondering what the logic/thought process is behind the decision to hide the WP Admin menu for the custom post type? All this does is make it harder to reach the private pages in the admin since we need to open users, find the user, then click on the private page link. Surely it would be easier to simply have the private pages post type as a menu item so we can go there directly? I’m very interested in the pro version of the tools, but this is one of the decisions in the admin setup that is making me scratch my head a bit and hesitate. That’s because you reach them from the backend user listing. They are tied to a particular user anyway. So listing them also as a top level menu item would just clutter the UI. At least that’s the reasoning behind it. Please note there isn’t a pro version of Client Portal. Both Profile Builder Pro and Paid Member Subscriptions solve other problems.